Overview: We’re going to use the 9v battery to power our Arduino so that we can use it anywhere we like, without it having to be plugged into a computer for power. Completely disconnect your Arduino from the breadboard. Connect the 9v battery to the snap fitting, and push one red and one black M-M jumper into the connector at the other end of the snap fitting. Connect the other end of these jumpers to the power rails of the breadboard, making sure the colours match all the way through. Now the power rails can give us 9v of power: the perfect amount to power an Arduino! Connect the jumpers from the barrel jack to the red and black power rails respectively and plug it into the Arduino power socket. 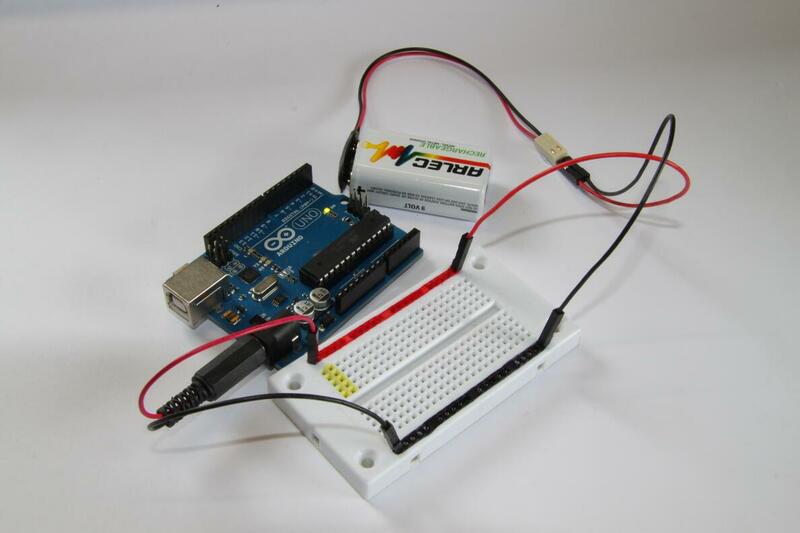 We now have a battery-powered Arduino! We can hit the road! You can now rebuild your Night-Time Alarm by following the instructions from Challenge Three, but you can take your alarm anywhere you like -very handy in the event of a zombie attack. You will use these skills later by: Your Zombiebot will eventually be let loose into a room so cutting the ties with your computer is pretty important. Battery power = Freedom!